The first time I saw previews of the new comic Princeless, I knew immediately that I wanted to get it for my 7-year-old daughter. But while it’s a great book for kids, it’s also a smart, funny and just plain delightful read that should appeal just as much to adults. Written by Jeremy Whitley, Princeless stars Adrienne, a sharp young princess who calls complete BS on the typical happily-ever-after tale. After her mother narrates the Rapunzel story, Adrienne offers a scathing, brilliant critique while pointing out numerous plot holes. A dragon dies after one sword blow? Really? And how the heck did Rapunzel even get down considering her lack of muscle tone? Unfortunately, Adrienne winds up in the same predicament as Rapunzel. On her 16th birthday, her parents decide to lock her in a tower, where she is to remain until a worthy prince can get past a guard dragon to rescue her. (In one of several chuckle-worthy lines, she accuses said dragon of being “part of the system.”) It’s part of her Darth Vader-esque father’s effort to bring forth a suitably manly successor to the throne, since he’s decided that his son Devin won’t do. The king has greatly underestimated his daughter’s pluck. In fact, Adrienne has hatched a plan to rescue her six other sisters, who are being held captive in towers of their own. 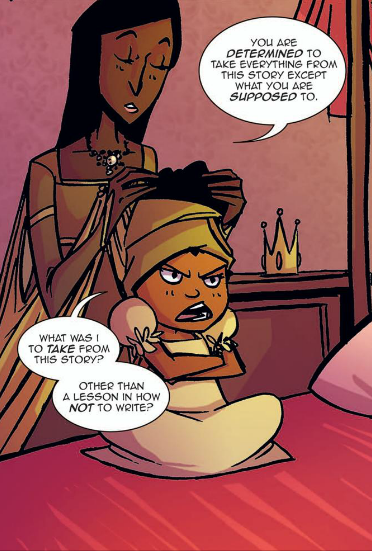 The anti-princess story can be its own cliche, but Princeless is so well-written that it never falls into that trap. Whitley doesn’t talk down to young readers or underestimate their since of humor. M. Goodwin’s illustrations are energetic and fun, and he gives Adrienne perfect facial expressions. It’s important to me that my children see characters who look like them in comics, so I’m very happy that a black girl has a starring role in a good, kid-friendly book. Whitley, who recently became a dad, told Girls Gone Geek that Princeless was inspired in part by his daughter. “Though I wanted the setting to be a fairy tale-like land, I also wanted Adrienne to be a real girl that shared experiences with real girls,” Whitley said. As a bonus, the first issue contains “Mr. Froggy,” the hilarious backstory (illustrated by D.E. Belton) of a young royal who’s dragged off to Prince Charming’s Charm School for Future Kings. Prince Charming is like the harshest life coach ever, a perfectly coiffed one who rails against helmet hair and insufficient smirking. Note: Peasant tears are an excellent styling product. Issues #1 and 2 of Princeless are out now, and even if you buy this comic for the youngster(s) in your life, there’s a good chance that you’ll end up borrowing it to follow Adrienne’s adventures. I will mos def have to look out for it! It makes me so happy that this book exists! I know there’s not much info out there but, as a bonus “M. Goodwin” is a woman. As a friend of Goody’s, I don’t think he’d agree.